A campaign is to be launched to stop dangerous pavement parking in a village. Offenders may even find their cars and registration plates photographed and then displayed on the internet. The campaign, which has police backing, is the initiative of Alvechurch Parish Council. It is in response to serious problems caused outside the village schools in Birmingham Road, but applies to all roads across the parish. It has also been supported by the schools, which will be urging motorists to think of the safety of children when parking. A leaflet (above right) explaining the dangers that are caused and potential offences will go to all parents of pupils and be delivered to homes near the schools. The parish council said it was concerned about vehicles being left partly or wholly across a pavement, causing obstruction to pedestrians, especially children, the elderly or those with disabilities. It told The Village: “The council is responding to a number of individual complaints from residents and from our local headteachers, who are worried about the potential dangers to children near the schools. The campaign urges parents dropping off or picking up their child at a local school to think about where they are parking: “Don’t park on double yellow lines, on zig-zags near crossings, near to the roundabout outside school or on any pavements. Use the village car parks if the weather is good enough and walk. 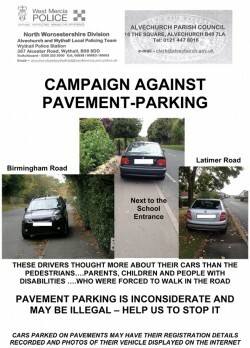 “If you’re a resident or visitor, remember pavements are for pedestrians not vehicles. “If you’re a pedestrian, record the details of any offending vehicle and give them to the parish council,” says the parish, although it cautions against challenging a driver who has parked on the pavement because it could lead to confrontation.